(《複数形》 音節phar・ynx・es，pha・ryn・ges 発音記号・読み方/fəríndʒiːz/) 【解剖】 咽頭. the hollow tube inside the neck that starts behind the nose and ends at the top of the trachea (windpipe) and esophagus (the tube that goes to the stomach). the pharynx is about 5 inches long, depending on body size. also called the throat. From New Latin pharynx, from Ancient Greek φάρυγξ (phárunx, “throat”). 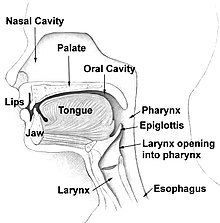 (anatomy) The part of the alimentary canal and respiratory tract that extends from the back of the mouth and nasal cavity to the larynx and esophagus. “pharynx” in Dictionary.com Unabridged, Dictionary.com, LLC, 1995–present.